Laney College celebrated Dia de los Muertos (Day of the Dead) on Thursday, Nov. 2 at the lobby of the Tower Building. The event featured a reception at the June Steingard Gallery which currently has a Dia de los Muertos exhibit that ends Nov. 16. Dinner was served and participants were entertained by a traditional Danza Mexica (Aztec dance). The event was primarily coordinated by faculty Manuel Alcala, Arturo Davila, Leslee Stradford, and Alicia Caballero-Christenson. Rosa Parra (top center photo) placed and decorated all the Day of the Dead artifacts in the gallery. 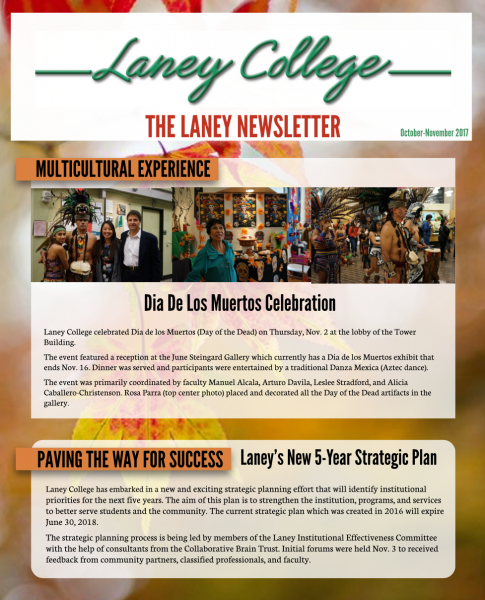 Laney College has embarked in a new and exciting strategic planning effort that will identify institutional priorities for the next five years. The aim of this plan is to strengthen the institution, programs, and services to better serve students and the community. The current strategic plan which was created in 2016 will expire June 30, 2018. The strategic planning process is being led by members of the Laney Institutional Effectiveness Committee with the help of consultants from the Collaborative Brain Trust. Initial forums were held Nov. 3 to received feedback from community partners, classified professionals, and faculty. This semester’s play, “FOR O.” (For Oakland) brought in over $6,000 to the Theater Arts Department. The play opened Nov. 2 at Odell Johnson Performing Arts Center and had its last performance, Nov. 9. “FOR O.” was written by Antonette Bracks, a former Creative Writing student at Laney College. The plot personified Bay Area cities and touched on the subject of gentrification in a humorous and original way. According to Theater Arts Chair and play director Michael Torres, the show was a big hit with audiences who had the house packed during weekend performances. Last month, the Nor-Cal Journalism Association of Community Colleges presented Laney Tower student journalists with several top awards, including news and opinion writing, and design. Brian Howey and Sarah Carpenter were among the award-winning students. Congratulations! Laney College was pleased to be one of the designated stops for the Historically Black Colleges and Universities (HBCU) Caravan on Thursday, Nov. 2. There were approximately 22 HBCU campus representatives on site discussing guaranteed transfer program options for Laney students. Some 250 high school students also attended and were hosted for lunch at the Umoja-UBAKA Village. The 12th cohort of Laney College students in the Alameda County Management and Supervision Certificate program graduated on Oct. 3. 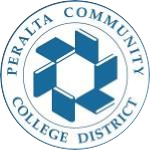 This 14-month compressed certificate program is a partnership with Alameda County that has existed since 2005. Laney Business Instructor Kim Glosson has taught all 12 cohorts and is now working with the 13th. According to the Alameda County Training and Education Center website, “Through this program, students build bonds and support systems which propel them to pursue greater opportunities after graduation. Backed by their newfound experience and accolades the graduating class have nothing holding them back.” Congratulations! The little ones from the Children’s Center had their trick-or-treat bags filled with lots of delicious sweets at this year’s Halloween candy-extravaganza, held Oct. 31 at the Student Center. The event was organized by the Associated Students of Laney College (ASLC) and classified professionals.